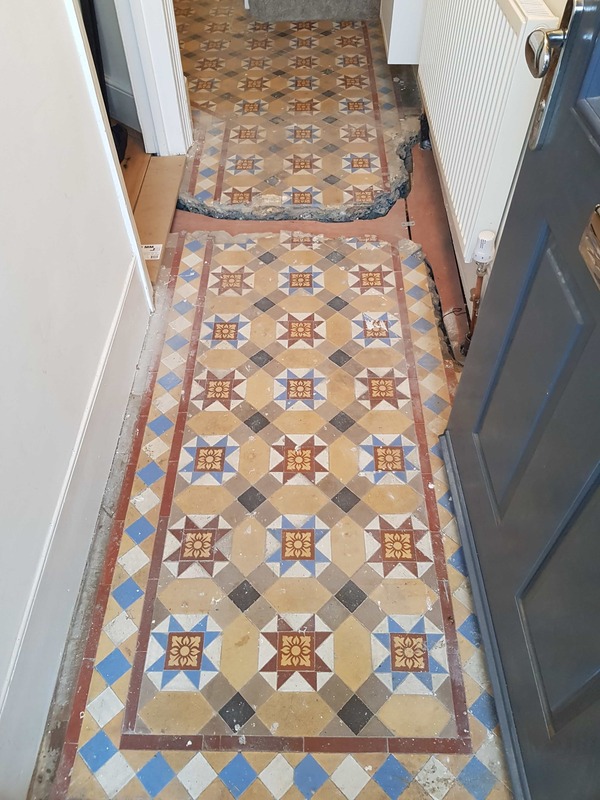 The owners of this property in Palmers Green, North London had uncovered an original Victorian hallway floor during renovation work. However, the priority was to have a new central heating system installed so they had to make a decision to allow the heating engineer to rip up part of the floor in order to lay new pipes. With the floor now missing a large section most customers would agree to have the hole back-filled with concrete and then have lino installed on top, however keen to have the floor restored as an original feature they reached out to Tile Doctor who have a lot of experience in this field. Our brief was to infill the excavated section and reinstate the floor with new original style Victorian tiles to match the existing ones. The existing floor had been covered in Carpet which had been secured using carpet gripper fixed to the floor using adhesive, there were also old paint splashes from decorating that would need to be removed. Our first job therefore was to remove the glue and paint by applying a strong dilution of Tile Doctor Remove & Go which is a coatings remover especially designed for use on tile and stone. The product was applied, left to dwell for about twenty minutes and then scrubbed into the floor, this softened the paint and glue which could then be carefully scrapped off tile tiles. The next step was to give the floor a deep clean with a strong solution of Tile Doctor Pro-Clean to strip off what remained of old sealers and extract any ground-in dirt from the pores of the tile. Naturally this work had to be done in two sections due to the missing tiled section and then once complete each part of the floor was given a good rinse and the slurry extracted using a wet vacuum. The floor was then inspected and a second clean was carried out to remove any stubborn staining or residue followed by a steam clean. Following the two stages of cleaning we checked the existing floor pattern and prepared the hallway by levelling the floor in preparation for inlaying the new tiles which were chosen to offer the best possible match. We were able to source reclaimed tiles that would match up to the pattern and during this phase of the restoration work we carried out any loose tile and grout repairs and re-grouted the newly laid tiles. With the original tiles clean and the hallway rebuilt we left the floor to dry off fully overnight. On our return we first checked the tiled were dry and that the grout in the new section was clear of any grout smears from the tiling work. Happy with the condition of the hallway we first applied a coat of Tile Doctor Colour Grow which is an impregnating sealer that will protect the tiles from within by occupying the pores within the tile, it also enhanced the colours in the clay tile. Once the first coat of sealer was dry it was followed by five coats of Tile Doctor Seal & Go which adds further layers of protection and adds a nice subtle satin finish that works really well on Victorian tiles. The work went very well, and the sealer consolidated the new and old tiled sections to form a seamless floor. 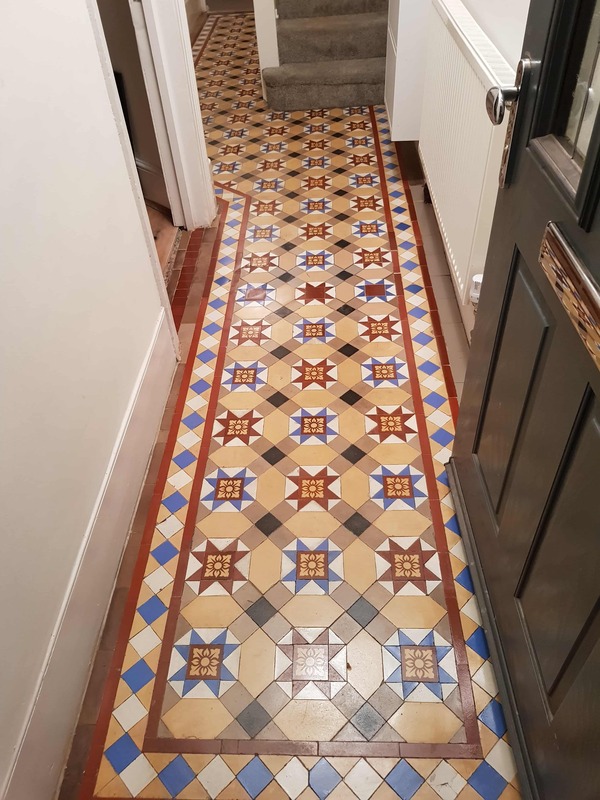 This entry was posted in adhesive removal, Deep Cleaning, London, palmers green, rebuild, renovation, Replacement Tiles, Tile Cleaning Activities, Victorian Tiled Hallway, Work History by TileProf. Bookmark the permalink.